Steven Schick was born in Iowa and raised in a farming family. For the past thirty years he has championed contemporary percussion music as a performer and teacher, by commissioning and premiering more than one hundred new works for percussion. Schick is Distinguished Professor of Music at the University of California, San Diego and a Consulting Artist in Percussion at the Manhattan School of Music. In 2008 Schick received the “Distinguished Teaching Award” from UCSD. He was the percussionist of the Bang on a Can All-Stars of New York City from 1992-2002, and from 2000 to 2004 served as Artistic Director of the Centre International de Percussion de Genève in Geneva, Switzerland. 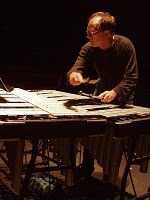 Schick is founder and Artistic Director of the percussion group, “red fish blue fish,” and in 2007 assumed the post of Music Director and conductor of the La Jolla Symphony and Chorus. Steven Schick’s book on solo percussion music, “The Percussionist’s Art: Same Bed, Different Dreams,” was published by the University of Rochester Press in 2006, and a 3 CD set of the complete percussion music of Iannis Xenakis, made in collaboration with red fish blue fish, was issued by Mode Records later that year. In 2009 along with red fish blue fish Schick will release DVDs of the early percussion music of Karlheinz Stockhausen and Roger Reynolds Sanctuary. Recently Schick has worked with composer Paul Dresher and writer/director Rinde Eckert to make an evening length solo theater work called “Schick Machine.” Schick has founded and is artistic director of “Roots and Rhizomes,” an annual summer course on contemporary percussion music held at the Banff Centre for the Arts.